Well, for those of you who are interested, The Properties of Numbers (I) was way, way back in 1994, No 3277 to be precise. That one was a long time before my current solving spree with the Listener, but checking it out, it was also a 10×10 grid and started with the square, cube, prime and palindrome clues, but covered the numbers from 1–50. This week I started fairly well with the square and cube at 1ac and things moved along quite slowly for about 3 hours. Then there was a huge pause which made it obvious that I hadn’t a clue what to do next. After an hour of standing still, I decided that I needed to go down the pub and try again the following day. The next day came and it dawned on me that analysis of those pesky digit sums needed more than superficial attention. 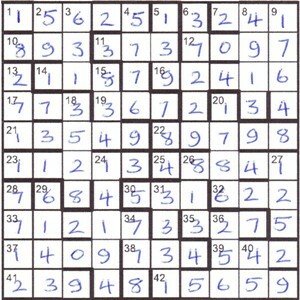 I can’t remember which clue got me going again, but another few clues saw the grid beginning to fill out and the number of options that I had in some of the squares was gradually whittled down. 2 hours into day 2, and another long pause came and went. Eventually, after 2 more hours, all was finished — 8 hours in total. What an enjoyable solve it was, though, and what a delight it was not to have one of those bloody hares lurking in the grid. Except… there in the top left corner was the numeric equivalent 8-1-18-5. Bugger! Many thanks, Piccadilly. What a fantastic idea for a puzzle. I’m sure it must have been a tricky construction, but I hope we haven’t got to wait until 2040 for the next one. This entry was posted on 8 September 2017 at 6:30 pm	and is filed under Solving Blogs. You can follow any responses to this entry through the RSS 2.0 feed. You can leave a response, or trackback from your own site.